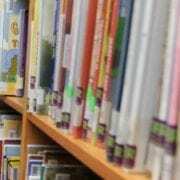 Editor’s Note: Allison Reynolds-Berry and her husband, Patrick, both participated in the Casa de la Solidaridad program as undergraduate students. 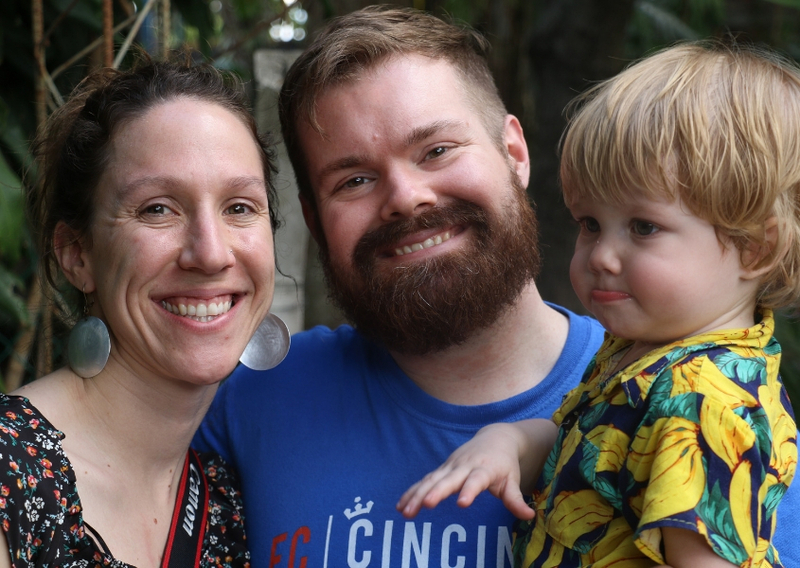 The couple recently visited El Salvador with their one-year-old son, Colin, for the commemoration of the Casa program as it came to close. Allison provided this reflection on how the program has affected her career, her marriage, and she and her husband’s life as parents. After 9 years of being away from El Salvador—I was a student at Casa de la Solidaridad in the spring of 2005 and a Community Coordinator for students during the 2006-2007 school year—the Casa commemoration was an opportunity to reunite with Salvadorans in my praxis site, the Casa staff, and other students who have become some of my best friends. 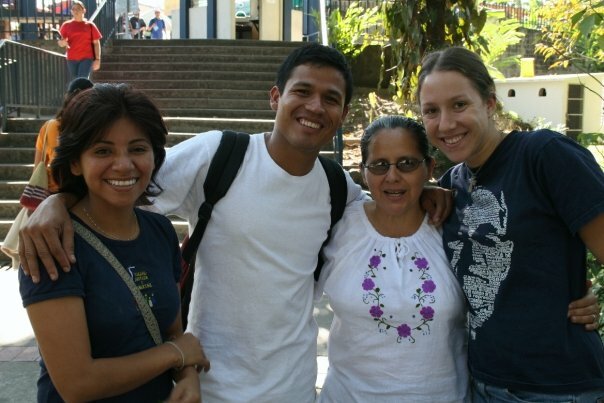 Reynolds-Berry (left) during the ’06-’07 academic year with fellow Casa de la Solidaridad staff members Griselda, Julio, and Oti. I currently work as the executive director of the Intercommunity Justice and Peace Center (IJPC) in Cincinnati, OH—an education and advocacy organization that mobilizes people to take action around issues like immigration, including recent advocacy for DACA and the Dream Act. 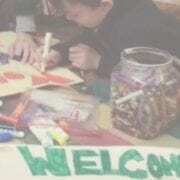 I initially came to IJPC because of a desire to continue working with Spanish speakers. Hearing more about the worsening economic context and violent realities in El Salvador has given me a stronger sense of urgency to advocate for systemic change. 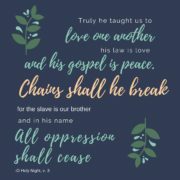 This was made most clear by Rick Jones, with Catholic Relief Services in El Salvador, who spoke to us during the commemoration activities about not only the gang violence but the corruption of police and the systemic violence still perpetuated by those in power. Salvadorans will keep fleeing the violence as their desperation increases. Though I am unsure of the impact I can have on El Salvador, the need for comprehensive immigration reform and the need to continue welcoming asylum seekers into the U.S. is clear. The small children I gave computer classes to in my praxis site are now college age—the same age as the young immigrants I work with at IJPC. We’re working to do better for them and their families. 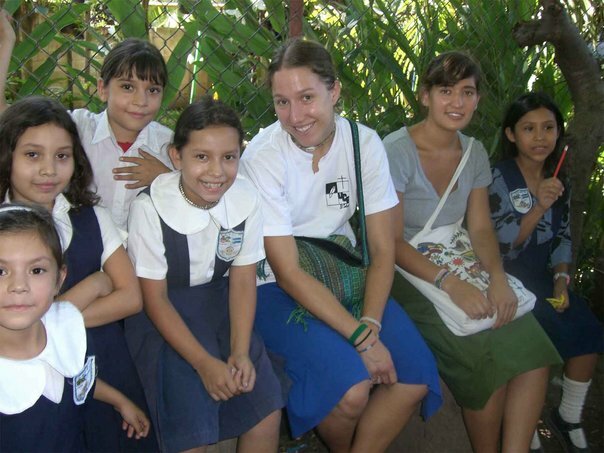 Allison Reynolds-Berry (center) during the ’06-’07 school year with a fellow Community Coordinator (to her right) and young Salvadoran students at a praxis site. Patrick and I see our primary challenge before us as increasing our commitment to one another and being in solidarity with the community around us while advocating for immigrants in Cincinnati. During the commemoration Mass, we sang “Casa Abierta,” a song that has come to be a theme of the Casa. One line says, “there’s a place for you at our table,” and if we truly take that as the invitation to create space for the least among us, then not only has the Casa succeeded in doing that, but it is my charge as an alum to carry that forward. 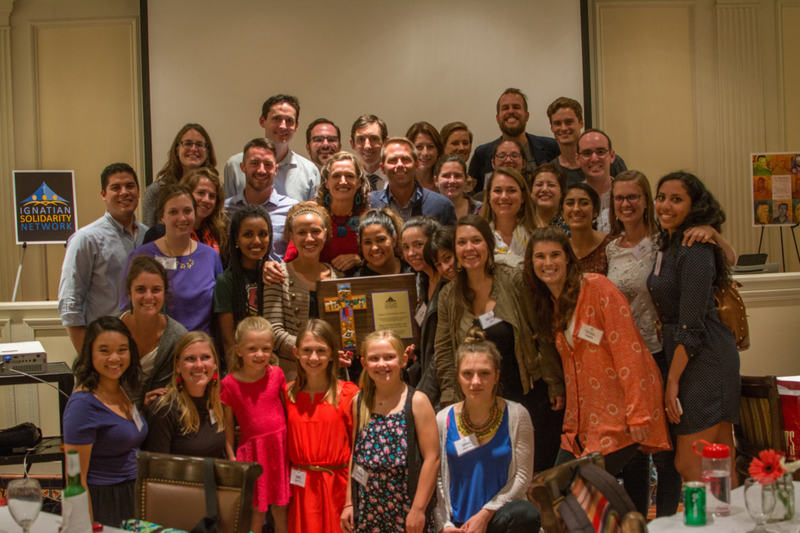 Kevin and Trena Yonkers-Talz with Casa alums and their children in 2015 at an event honoring the couple with ISN’s Legacy of the Martyrs award, given to those who have made significant contributions to sustaining the witness and legacy of the Jesuit martyrs and their companions. In many ways, the Casa was formative for Patrick and me individually—and for us as a couple. During a Casa reunion in 2009, we reconnected in Kevin and Trena’s garage and decided to be more intentionally in touch with each other. We began writing letters between Boston and Nicaragua while Patrick entered his second year as a Jesuit Volunteer. The Casa experience is the foundation of our relationship and family. Kevin and Trena’s daughter, Hannah, was born when I was a student. Seeing Trena and Kevin raise this tiny baby and, at the time, their two sweet older girls in this context was absolutely beautiful. Trena normalized breastfeeding for me and showed me the strength of motherhood. Kevin and Trena both celebrated the girls as individuals and showed that it’s possible to passionately work for justice and live in solidarity with a community while raising a family. 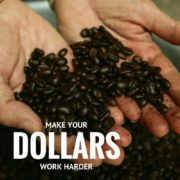 Though not without its challenges, raising a family made them more connected with Salvadorans in many ways. 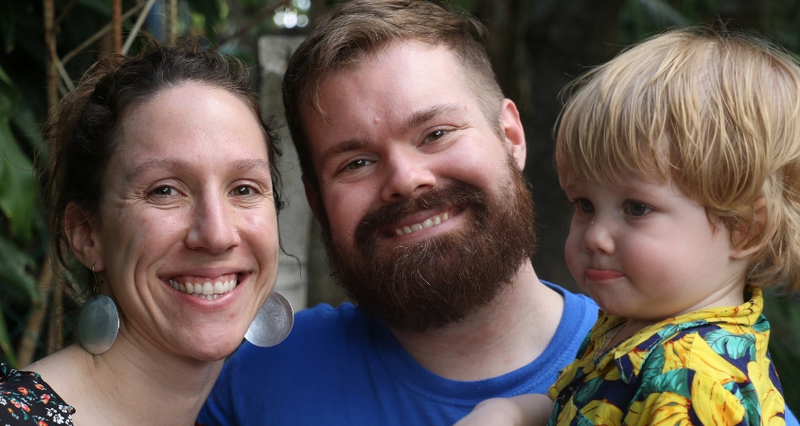 Allison, Patrick, and Colin Reynolds-Berry in El Salvador in the spring of 2018. I saw the power of that when I brought my 1 ½-year-old son Colin with me to my praxis site during our time in El Salvador for the commemoration. Where there were awkward silences when I was a student, during this visit he filled the void and gave us something to laugh about or comment on. Colin loved chasing chickens around every at each house we visited (it’s a good thing he’s only 1 ½ and didn’t understand I turned down the gift of a baby bunny for him!) I let go of the structured day I usually keep for him and embraced the opportunity to get dirty, chase the chickens, and laugh with old friends. 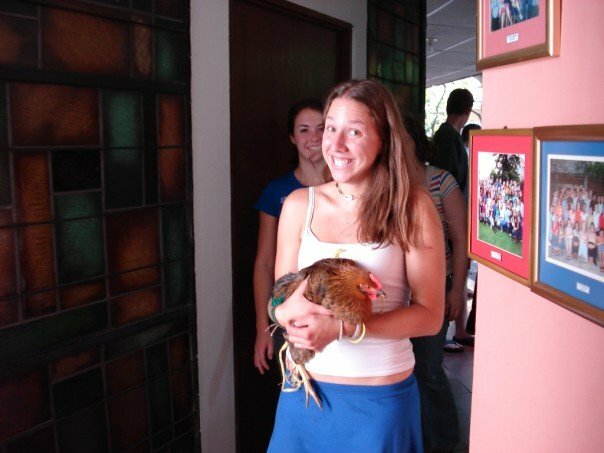 Allison Reynolds-Berry in El Salvador as a Community Coordinator—with a chicken—a cultural bridge more than a decade later during her toddler son’s first visit to El Salvador. I hope that when Colin grows up, he’ll remember the stories we tell him about going to El Salvador, and see that stamp in his passport as an invitation to return to a place that has a story, a community, and a connection rooted in history that he can come to know in his own time. Long live Casa de la Solidaridad.